The heir to a long tradition of cooperative work, the first expression of which was in the Colonia Vitivinícola de Campano in 1884. It later absorbed some of the members and the solera (wine-stocks) of the now vanished Cooperativa Andaluza San Juan Bautista, founded in 1956, which itself took over from the Sindicato de Viticultores del Padre Salado, created in 1914. Pol. Ind. El Torno. Calle de la Madera, nº 5. 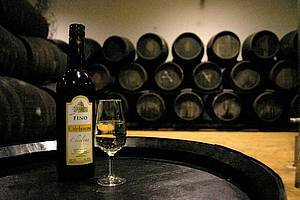 WINES: Fino Chiclanero (Fino), Fino Salinas (Fino), Moscatel Don Matías (Moscatel), Cream Sarmiento (Oloroso dulce), Oloroso Matadero (Table White) y Moscatel 1812 (Moscatel). Winery founded by Pedro Aragón Morales, who opened a small wine-press and a winery. 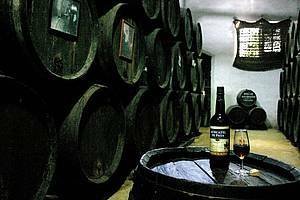 His son, Juan Aragón Ramos, inherited the press and part of the solera (wine-stocks). A generation later under Diego Aragón Periñán (1896) the winery was finally established in the Calle Olivo. His son, Manuel S. Aragón Baizán (1916) laid the foundations for the company we know today. WINES: Fino Granero (Fino), Moscatel Gloria (Moscatel), Manuel Aragón Tinto (Red), Cream Viejo Arrumbaó (Cream), Manuel Aragón Sauvignon Blanc (White) y Manuel Aragón Rosado (Rosé). SERVICES: Wine Shop. Tavern. Meeting Facilities. Room rental for celebrations. Visit to Vineyard, Winery and range of bottled with tasting included (advisable to make an appointment). The winery Bodegas Miguel Guerra was started in the 1920's by Miguel Guerra Virués, a busy man full of new ideas. Year after year he extended his vineyards, his botas (American oak barrels) and his wines produced using the holera system in the pine-wood warehouse in which he stored the palillos, the nickname given to the wine-stakes from which the Fino Palillo takes its name. Huerta El Vicario. Avenida de la Diputación s/n. WINES: Fino Palillo (Fino), Oloroso Gran Reserva (Oloroso semi-seco), Cream Tarugo (Cream), Finito (Fino), Astilla (Young white table wine) y Moscatel Miguel Guerra (Moscatel). SERVICES: Wine shop. Meeting Facilities. Room rental to celebrations. Visit with Tasting (advisable to make an appointment). La actividad comercial de esta bodega se remonta a los años finales del siglo XIX cuando los hermanos Primitivo y Tomás Collantes Lloredo llegan a Chiclana procedentes del Valle de Iguña (Cantabria), realizando su primera vendimia en 1903. La bodega se constituyó en Sociedad Regular Colectiva en 1946, transformándose en S.A. en el año 1973 y adaptando sus estatutos en 1992. HORARIO VISITAS: lunes a viernes de 07:30 15:00 horas. Visitas grupo mínimo 10 personas. Imprescindible reservar con mínimo dos días de antelación. A traditional family-owned winery that combines age, tradition and craftsmanship. Outlet for the sale botled wines. 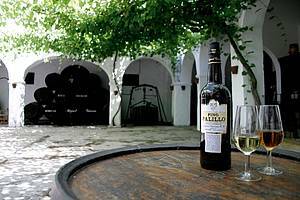 WINES: Fino La Barrosa (Fino), Moscatel de pasas (Moscatel), Moscatel Blanco (Moscatel), Marian Cream (Cream), Oloroso Seco (Oloroso), Amontillado Solera (Amontillado), Moscatel Gran Reserva (Moscatel) y Dulce Naranja (Vino dulce). SERVICES: Wine Shop. Visit with Tasting included ( 1,00 €, advisable to make an appointment). 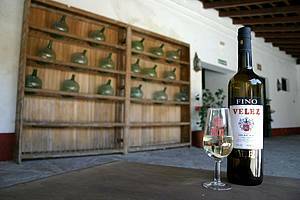 The history of the Bodegas Vélez winery dates back to 1857. It was founded by Juan Manuel García, from Cabuérniga in Cantabria (northem Spain), who ran shops selling food and drink in Cadiz and San Fernando and had another shop with a wine-cellar in Jerez. The business progressed quickly between 1910 and 1920, when it changed name to José Vélez Sánchez, husband of the only daughter of the founder and also from Cantabria. 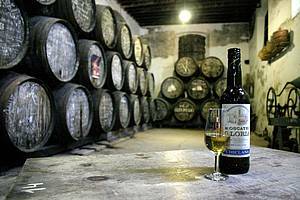 WINES: Fino Vélez (Fino), Fino Reguera (fino), Oloroso 1960 (Oloroso), Amontillado Fino Vélez (Amontillado Fino), Cajita Cream (Cream) y Costa de la Luz (Moscatel Dorado). SERVICES: Wine Shop. Tavern. Meeting Facilities. Room rental for celebrations. Visit with Tasting included (advisable to make an appointment).